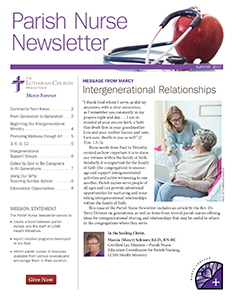 The LCMS Parish Nurse Newsletter supports parish nursing (also called faith community nursing) through education, sharing of ideas and resources, discussion of current topics relating to congregational health ministry and a continuing bond between parish nurses and the staff of The Lutheran Church—Missouri Synod. 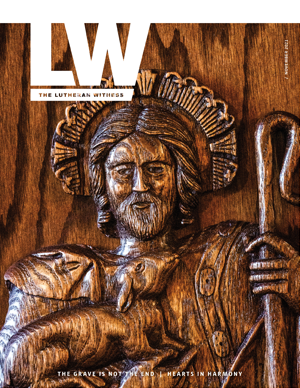 Sign-up to receive the Parish Nurse Newsletter by email through the LCMS e-news system. Subscribe to the Parish Nurse Newsletter e-news in your myLCMS profile. LCMS Parish Nurse Newsletter provides information and insight about including a spiritual component when caring for the whole person. LCMS Parish Nurse Newsletter provides information and insight about handling times of transition in life — whether your own or when caring for others. LCMS Parish Nurse Newsletter provides basic information and insight that can be used when caring for individuals who have mental illness concerns. 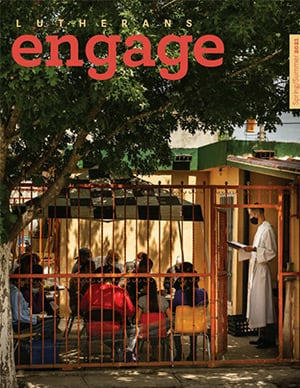 This issue of the Parish Nurse Newsletter from The Lutheran Church—Missouri Synod highlights how essential it is for parish nurses to complete program reviews (evaluations) of their ministry on a regular basis.